Keeping oneself safe is the most important point for any individual doing road construction. There are many aspects involved in safety-- being visible to vehicles is from most important. Anything can happen, for vehicles can be passing the entire day. Therefore safety vests are a must, and selecting durable highly reflective apparel is a top priority. 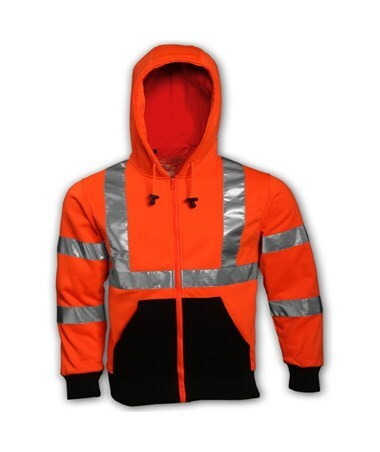 This ANSI/ISEA Class 3 Hooded High Visibility Sweatshirt is a comfortable roomy sweatshirt that will keep you visible in your work zone. A hood is attached for added warmth on windy days so that you can cover your head and ears, which is known to keep body warmth from exiting. Composed of high density 100% polyester to provice excellent warmth in cooler temperatures and designed with a cut and stretchy material that allows you to move freely while you work, this high-visibility sweatshirt is a great choice for spring and fall. A fluorescent orange outer shell with 2” silver reflective tape, along with its ANSI 107 Class 3 high visibility rating, provides reflective light for 360° nighttime conspicuity. 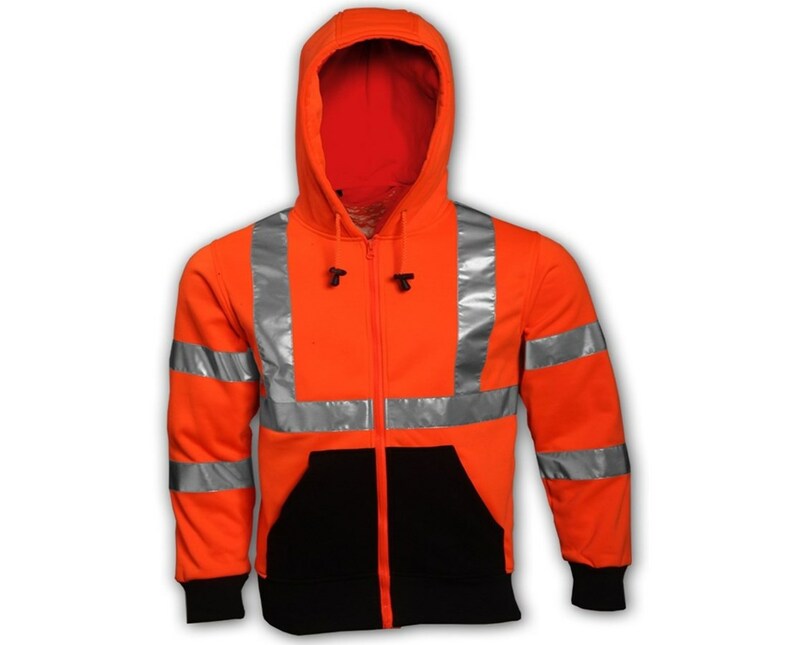 This hi-vis safety sweatshirt will help you be distinguished in time of danger or to vehicles when working on the road during daytime and nighttime. This Tingley Job Sight sweatshirt includes 2 front hand warming pockets, zipper closure, black elasticized polyester knit sleeve cuffs, black elasticized polyester knit waist band which constrict to prevent dirt from entering, as well as a front that is black on bottom half which helps conceal dirt. The small size sweatshirt has fluorescent pockets to comply with ANSI/ISEA Class 3 requirements. With that said, if you're looking for a comfortable high visibility safety sweat-shirt that's excellent for cooler temperatures while providing visibility allowing you to work at ease, then this is an excellent option. It’s a comfortable roomy sweat-shirt that will keep you visible in your work zone. Hood attached for added warmth on windy days so that you can cover your head and ears which are known to keep body warmth from exiting the body. Composed of high density 100% polyester providing excellent warmth in cooler temperatures. Designed with an excellent cut and material that stretches which allows you to move freely while you work. Front that is black on bottom half which helps conceal dirt. Includes 2 front hand warming pockets. Black elasticized polyester knit sleeve cuffs along with a black elasticized polyester knit waist band. A front that is black on bottom half which helps conceal dirt. Fluorescent orange outer shell with 2” silver reflective tape. Its ANSI 107 class 3 rating of high visibility provides reflective light for 360° nighttime conspicuity. It will help you be distinguished in time of danger or to vehicles when working on the road during daytime and nighttime.